My first Olympic outreach was in 1984, just a couple months after I married Stasia. For a couple of years a call to missions had been burning in my heart. In 1982, 30 days before his plane crash, Keith Green held a concert in Long Beach auditorium. Keith shared passionately his conviction that Jesus commanded all of us to go with the Gospel, stressing it should be the exception if we stay. There wasn’t a dry eye in the place. I know, because I was there. God called me to missions that night, and I assured Him that when the time came —-when I was released from my responsibilities as a youth pastor, I would go and not look back. Two years later, still a youth pastor, I decided it was time to leave my Jerusalem (San Diego) and take a team from my church to the LA Olympic Outreach. There were only a half dozen of us. We slept on Sunday school room floors at an Assembly of God church in West Los Angeles. We weren’t alone. We were grouped with a team of 12 Australians led by a New Zealander. These guys were troopers. Here I was —-a green, southern California boy who had never been outside the state of California whose “mission experience” began and ended with car washes and personal evangelism at the mall, and I felt like I had en-countered the Green Beret of God’s army. For three weeks we witnessed at Venice Beach, served water to athletes on the UCLA campus, reached out to homeless people in the inner city, engaged in intercessory prayer every morning and worshipped past midnight every night. I loved those Aussies! They were the coolest bunch of Christians I had ever met. I had no idea then that in a few years I would end up in Australia. For me, in the summer of 1984, the mission journey had begun. There was so much prayer and unity in the ’84 Olympic outreach that the crime rate dropped radically. There were ZERO homicides in Los Angeles during the games. Over a thousand people came to Christ each day on the streets. I was so excited about what was happening all around that one night I called Stasia and said “get ready to start packing, honey! We’re gonna be missionaries!” One year later we were. 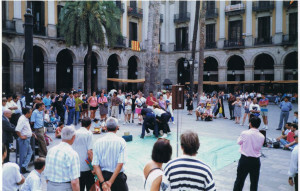 Ministering the Gospel through drama in Plaza Real in Barcelona, Spain, ’92 Olympic Outreach. Then in 1992 I led a team of Australians (does God have a sense of humor or what?) from Sydney to participate in the Barcelona Olympic Outreach. Our team was a talented bunch of actors and pantomime artists who per-formed riveting street dramas, presenting the Gospel clearly without so much as a word. We were housed along with over 5,000 others at a high school campus in Mataro’, 40 minutes north of Barcelona. The night before the Olympics were to begin, the Mayor of Barcelona faxed a special permit to our mission leaders giving us the “run of the town”–permission to work and per-form in any park and plaza and street corner in the city. We must have walked a hundred miles over those two weeks. Though Spain is extremely hard ground for the Gospel, we saw fruit and brought home some amazing stories and testimonies. One that sticks with me is the night a man started weeping at the end of one of our performances. He couldn’t stop. He shared with our translator that he was a mercenary—a hired killer—and he wanted to turn from what he had done, and receive God’s forgiveness. Our translator, who was from Argentina, stayed back with him long after we left to catch the train back to Mataro’. The next morning he came to us, beaming from ear to ear, announcing that the weeping mercenary found Christ in the early morning hours. 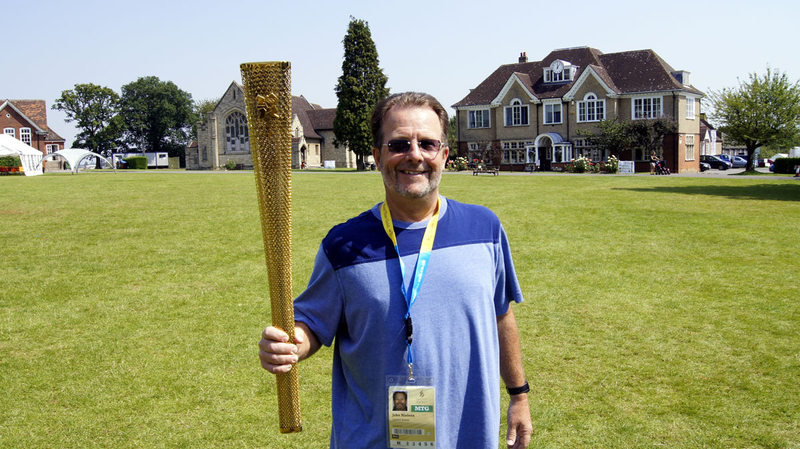 Holding the official Olympic torch in Harpendon, England during 2012 Outreach in London. Flash forward 20 years. My 23 year old daughter Lauren and I chaperoned a team from upstate New York on an outreach to the Olympics in London, England. 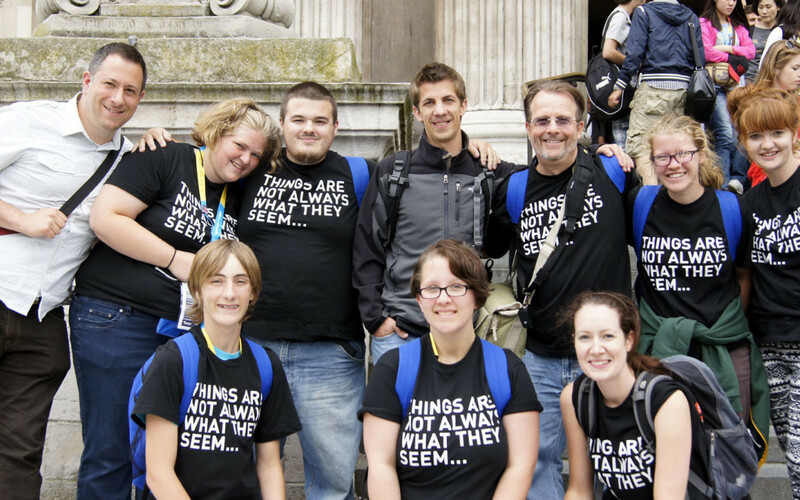 We represented Justice For Youth and worked alongside Stop the Traffick, a prominent Human Trafficking prevention organization launched by a prominent youth minister in the UK. Our team of 13 people joined dozens of other volunteers from all over the world, staffing brilliantly conceived and very effective displays. Besides engaging people directly on the issue of human trafficking, a primary focus of the UN Gift Box program was to gather signatures as a part of the “Global Initiative To Fight Human Trafficking,” interacting with hundreds of people each day from virtually every nation on earth. Letting Jesus shine bright through our lives in all we say and do, and being prepared to give an answer to aall who ask us the reason for our hope. This is the tried and true recipe to change the world, one person at a time! I look forward to Rio next year. Divine appointments await.